I accidentally highjacked Kyle's thread on his On30 track plan. Rather than continue to highjack his thread, I am starting a new thread for my railroad, currently called the Yellow Creek Western. If you would like more information on it, I have a blog at trainblog.tharbin.com. I'm just going to add enough here to give a little background information on what currently exists and where I would like to take the layout. I will break this into two posts. The first (this one) will give the background and the second will be the redesign. I am hoping to get some feedback like Lee B and KitbashOn30 started to give me on Kyle's thread. The original layout was called the Summit Ridge Railroad after the name that was on the station. 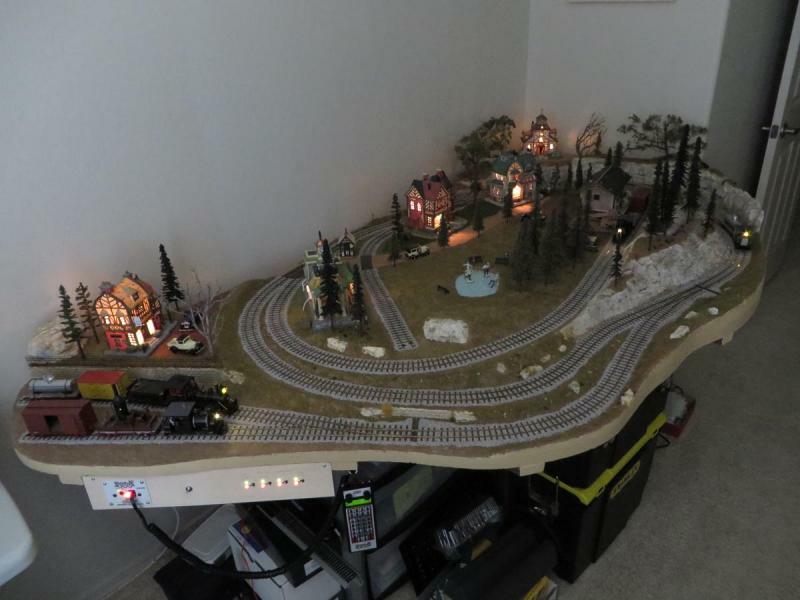 It was not designed to be an actual layout but rather part of a Christmas Village display in our living room during the Christmas season. 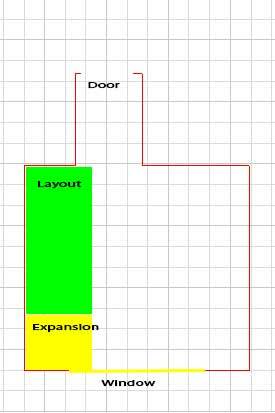 The layout is roughly 3.5 x 6.5 feet. 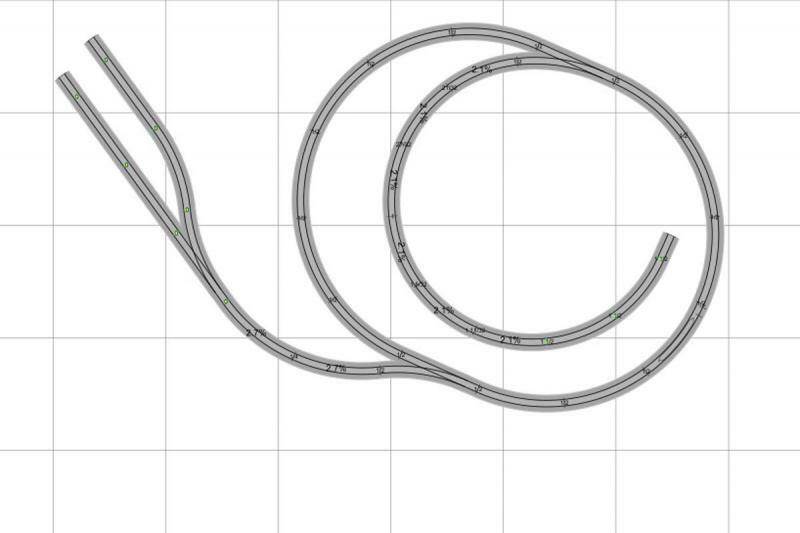 Rather than a simple oval of track, I added a few sidings. and to have a few places to park other cars to make it look more like a railroad. The layout was built on a 1" slab of pink foam and I used some WS 2% risers to add some grades. 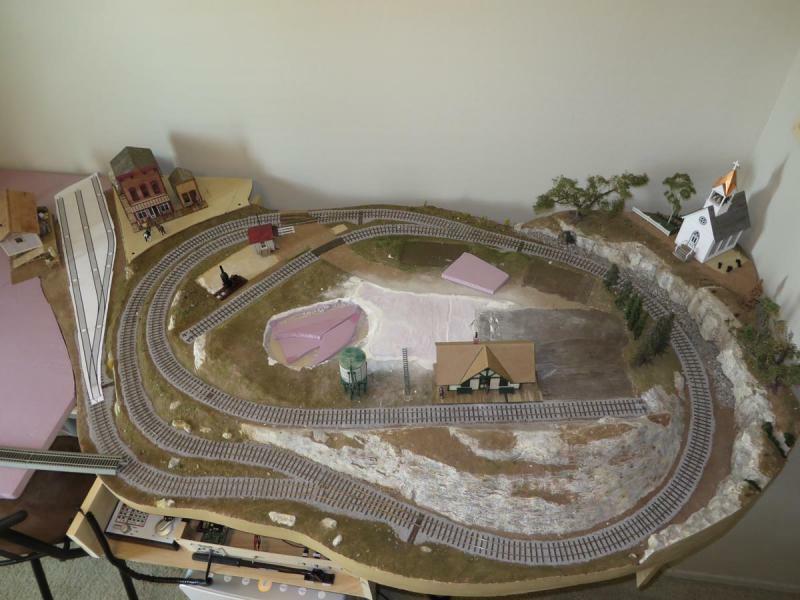 The layout was supposed to be stored most of the year so it was kept fairly thin and light. Originally the track was Bachmann EZ track just laid on the board. That was quickly changed but I never made a track plan. Basically, added some of Bachmann's filler pieces to enlarge the loop, turn it a little more toward the "staging yard" and straightened out the inside siding. Before I finished the initial landscaping I pulled off the EZ track and ordered some ME On30 code 83 flex and switches. I just did not like the look of the HO track and it was obnoxiously loud. The sectional look also made it too toy-like for my tastes. The ME track installed easily. I should probably add at this point that other than an N Scale sectional layout-on-a-door built 30 years ago, this was my first layout. This is a rough approximation of the final trackplan. Note that this was done after the fact in AnyRail so it is not exact. 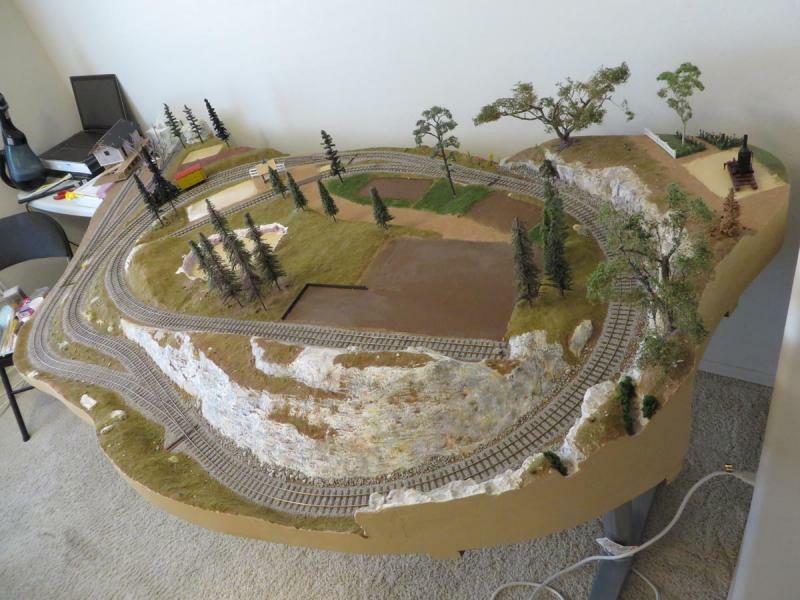 The trackplan was actually devised real time by fitting flex into the scenery utilizing the areas and ramps from the Bachmann track. and the switches are all #5 with servos under layout. This was how the Christmas Village looked two days before Christmas. 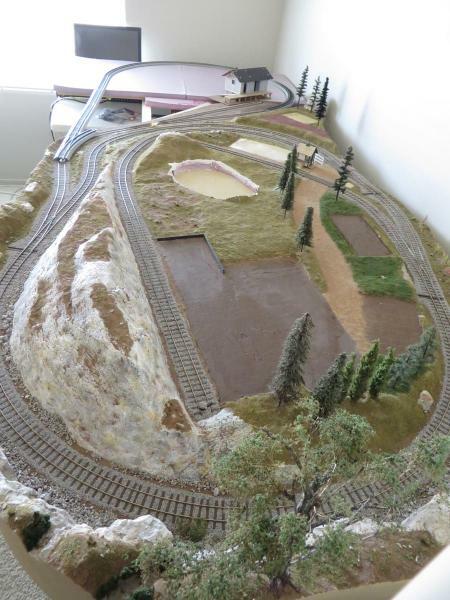 Since then, I went back and painted/ballasted the track, did more SculptaMoulding, added ground cover etc. I will follow up with another post that explains where the layout is today and where I would like to take it. The layout was moved to my office after Christmas and never left again. Just too lazy to move it back to the living room. After reading many posts about the problems with snow scenes (yellowing, dust and dirt, etc.) we decided to make it Christmas season but not snow covered. 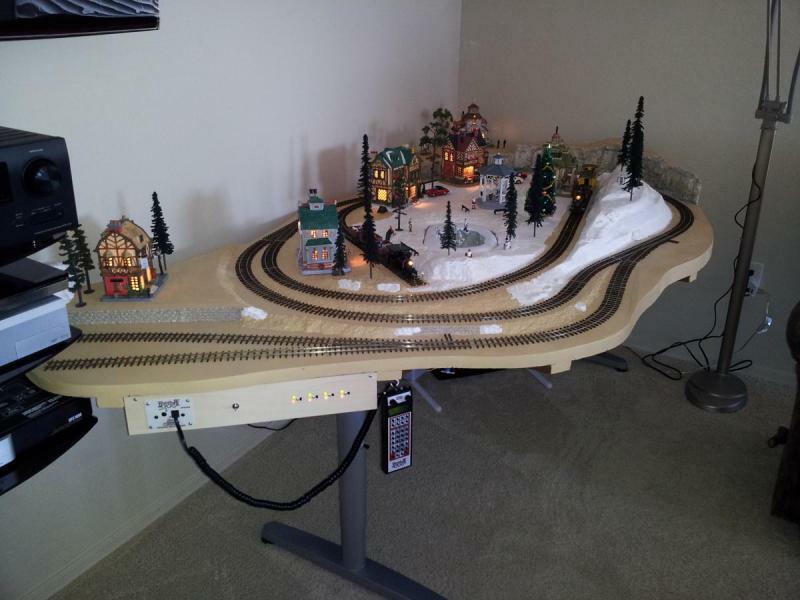 I puttered at the layout for several years in tiny dibs and drabs probably only a few hours per year and ran it occasionally--and all of the Christmas season. I eventually added a freight station that was a Rusty Stumps laser kit but I never finished it. The reason I took the photo above was because a friend gave me 2 dozen trees, a 0-4-2 Porter, a Davenport, another Zephyr and 18 pieces of ME On30 code 83 track. The two spurs that acted as staging were too short, even a few inches longer would have greatly increased their usefulness. Their is no passing siding, no escape tracks no way to turn an engine let alone train etc. This was, and still is, a display layout. First thing was I decided to move the freight station to the end of the staging area and extend the tracks. Then move a depot back to the end of the long inside spur. My wife mentioned that she liked my building more than the ceramic ones and maybe I should replace the buildings with my own. 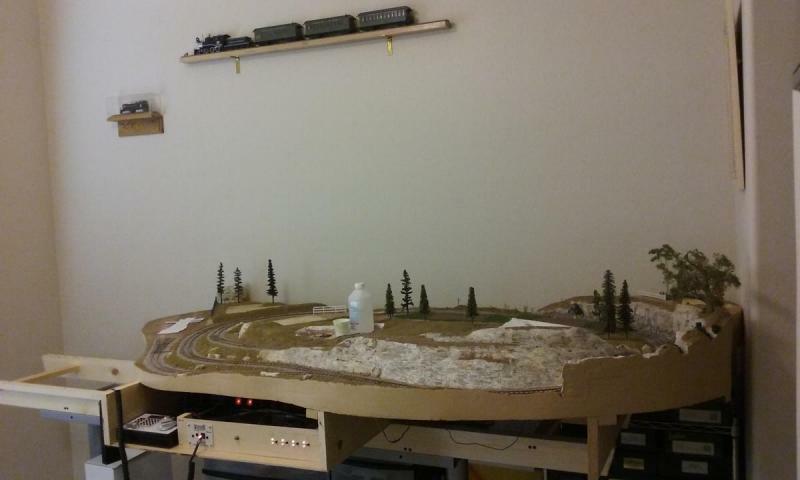 I needed to add some foam for the new freight station location anyway so I decided to enlarge the layout. I built two 8 foot L girders and attached them to the desk frame I was using and moved the layout to one end. My first thought was a reverse loop. It did not take me long to decide it was worse than no reverse loop, at least as configured. I also figured out that the height, while fine for a living room display, was too short for a layout. I added 1x6 crossbeams to elevate it more and to give me someplace to hang stuff. so I'm currently playing with building placement and realigning the "street" to handle more normal-sized O scale buildings. Well I don't really want to throw this layout away just yet. I'm learning a lot from tinkering with it and it has some emotional attachment as well. I would though like to fix it though and hopefully add a little more than chasing its tail to the layout before I retire it. I'd rather not mess with the back half if I can avoid it because getting those switches in where I could actually use the spurs was not easy. I played with it quite a few times to get something that worked. I will pull up at least the one section of the loop just in front of the small rock between it and the staging spur. It is the under-radius spot. Since I am pulling that up I could pull up the front switch as well. I have already pulled up the staging tracks back to the switch and I will pull up the switch. I am going to, will attempt to, build FastTrack #4s in the staging area. While I would love a larger loop (I like the train running while I'm working fairly often so I need a continuous run) I don't see an easy way to do it. I am considering just adding an engine terminal in the currently unplanned area. The short inside spur is currently thought to be a team track and the long one a passenger depot. Thoughts, suggestions (other than start over)? 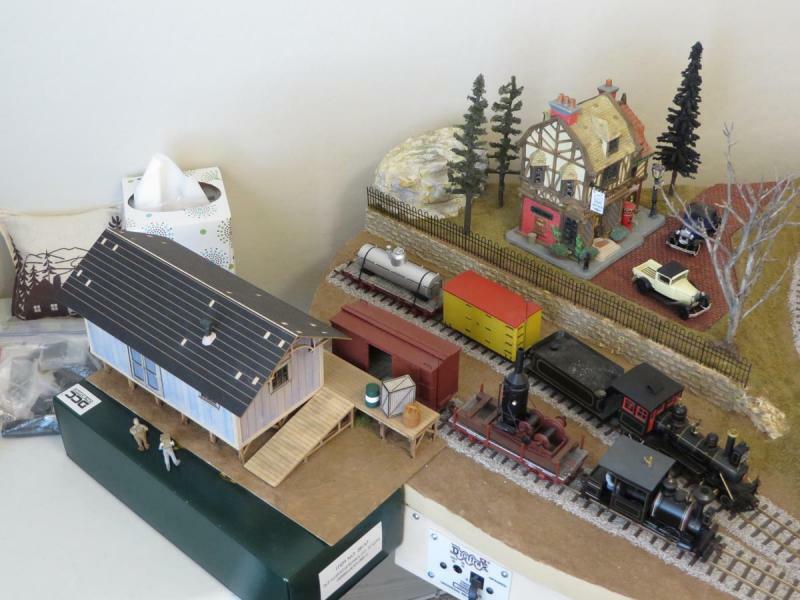 AWESOME story & photos covering the 'history' of your railroad ! ... just the kinda thing I like about Freerails ... 'Reality Railroading' ! I always admire the 'pioneering spirit' of the adventurous 'build & extend' kinda 'track non-plan'. I think it can work very well & it looks like yours is a good example of that. I'll leave ideas about that to the top brains of the Forum ! But I might have an idea or two . . . It looks like a great small setup, if you were looking to do more I would probably try to use the yard (not sure if it is called that) as an area to extend into a larger space. I was thinking like a small 4 inch shelf to run around the room and when you are transporting the layout a way to disconnect the layout from the run around. That could also add some space for larger trains as well. My wife likes that idea also. I can't see a way to make it work in the room I'm currently using however. The green area is the current layout and the yellow area is the currently proposed expansion area. The wall that the layout is on is 9'11" long. The window goes from about 3' up to about 7'. Since it is a south facing wall, the window gets a little warm in the summer so for 9 months of the year I have an insulated curtain that covers it. There is also a full slat-fin shade in the window casing that is normally closed. Things do not last long exposed directly to the window, even with the shade closed. There is also a walk in closet door that I forgot to show on the longer of the two short walls opposite the window wall. That closet door stays open all of the time to help cool the equipment in it (computers). For additional information, the largest loco that will run is a Bachmann inside frame 4-4-0. I have relegated the Mogul and the 36' passenger cars to a display shelf. The coaches will be 22' Mount Blue coaches (one already built). I still have the 18' Bachmann freight cars but they have been removed and will be replaced with 14' Chiver's Fineline cars and possibly a few 12' and 14' Silver City cars. Since both the the passenger and freight cars are close to a scale 6' width, I may use On2 track spacing instead of On30. The time frame I'm aiming for is the late 1800s, probably around 1880-1885. Thanks for the input, it is an appealing idea. I may move to another room that would allow at least an L-shape but I want to see what I can do with this space before I give up and move. Careful with the track spacing. You may need room to get your fingers in there to re-rail cars or for uncoupling. 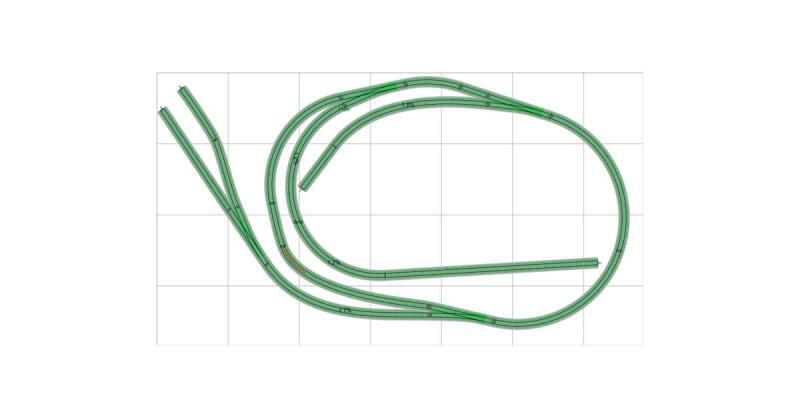 I keep a minimum spacing of 3.5" on parallel tracks on my 35n2 layout, but a little more is better. Right now there is little switching going on as the "layout" wasn't really designed for operation (not sure I could have done a decent operations layout anyway). Also the two spurs in the "staging area" are torn up for now. When I do switching moves I use a RIX decoupler but there is always the odd (Oh #!##!). The layout is so small that I try to economize everywhere I can. I am even switching to shorter cars to make it look bigger. To make it worse, I am seriously considering switching to Link and Pin couplers. Tom Harbin wrote: I am hoping to get some feedback like Lee B and KitbashOn30 started to give me on Kyle's thread. 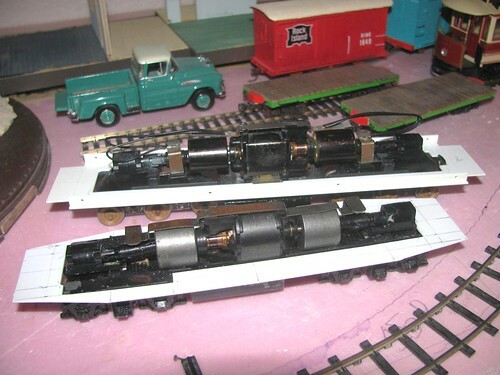 Seriously, the two spurs at the upper right, I'd put them together at the end with a turnout and just enough track for a loco to 'escape' from a head-in switching move. I'd also not have the interior spurs end so close to the mainlines. Trust me, they look odd when you do that (I cut a spur on my own layout back quite a bit after doing so before the scenery went in). (with a ramp for flat cars or along the side of the track for side loading for a boxcar). Tom Harbin wrote: The layout is so small that I try to economize everywhere I can. I am even switching to shorter cars to make it look bigger. but I built new bodies for some Bachmann HO 4-wheel cars in Thomas the Tank Engine range when some came available at close to half price. Also used some HO scale 36ft old timer, and Athearn 40ft, car frames. Well, dang, don't seem to have ever put any decent images of them up on Flickr. Another advantage of really short cars is that there is minimal coupler displacement from track centerline on really sharp curves. Do you mean the two spurs at the upper left? I was going to change that to three spurs that are just a little longer. If you look at the last photo of my second post I have an overlay of what I was planning to do. The overlay just uses Bachmann track sections since I didn't have FastTracks #4 pieces in AnyRail. I understand what you mean about the escape track. 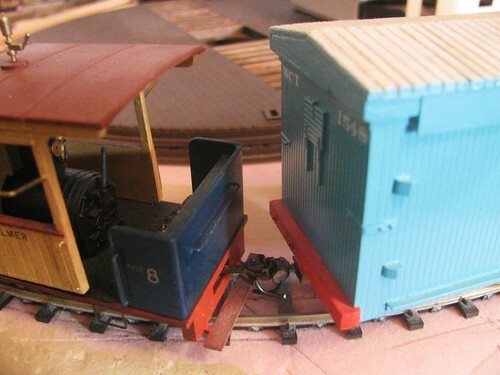 The reason they stop short of the back of the layout is that I plan on having a creek wind around from behind the spurs to the left of the freight station. I agree on the other spurs being too close to the mainline. The short one looks better now that it is a team track but still not great. The long spur to the depot looks dumb. but cutting it back some would probably be a good idea. I need to think about your last suggestion a little. I don't have a lot of room for my buildings as it is but another spur of the mainline would be good.